WILL ANURAG KASHYAP’S ‘COMMERCIAL POTBOILER’ WORK? MANMARZIYAAN: It is directed by Anurag Kashyap and marks the comeback of sorts for Abhishek Bachchan after more than 2 years. Taapsee Pannu and Vicky Kaushal are the other actors. It is co-produced by Aanand L Rai who incidentally began work on this film two years ago. At that time, the star cast comprised of Ayushmann Khurrana, Bhumi Pednekar and Vicky Kaushal. Luv Shuv Tey Chicken Khurana director Sameer Sharma was helming it then but it seems he failed to do justice. The shoot as a result was abruptly halted in a few days. After putting the project on backburner, it was revived last year with a new star cast (with Vicky Kaushal being retained) and a new director. The film has been noticed and it looks like an unconventional love triangle. Anurag Kashyap however promises it to be a commercial entertainer. There are 12 songs and the album on the whole has a distinct flavour. 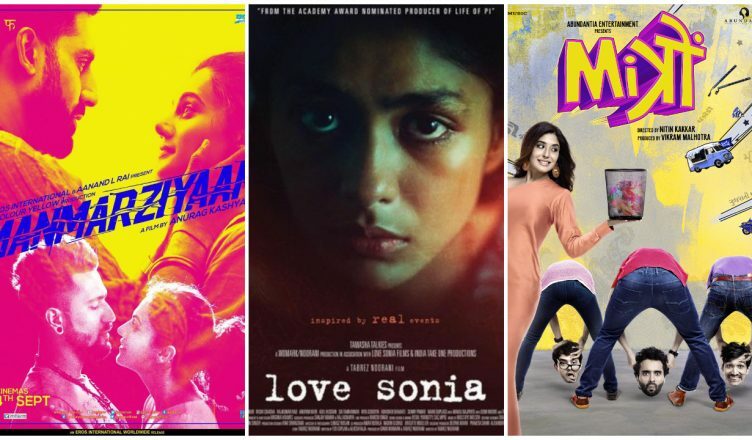 However, just like any other Anurag Kashyap film, the buzz is limited with his die-hard fans as expected making it sound like the most exciting film ever and flooding the social media with such comments. Due to the known star cast, the opening will be better than his last release Mukkabaaz, which opened at Rs. 81 lakhs. This one can have an opening in the Rs. 2-3 crore range. A good word of mouth will be very crucial for it to sustain, not just among his fans, but among the audiences at large. LOVE SONIA: This is a hard-hitting film that speaks about the international flesh trade. It has made a lot of noise internationally and finally releases in India tomorrow. It comprises of not just Indian actors like Mrunal Thakur, Richa Chadha, Manoj Bajpayee, Freida Pinto, Rajkummar Rao, Adil Hussain, Anupam Kher and Sai Tamhankar but also Hollywood actress Demi Moore. The reports are out that it’s a very disturbing but important film and moreover, it doesn’t look massy enough. The opening can be less than Rs. 1 crore but since the word of mouth is going to be positive, it can grow significantly on Day 2 and 3. A lifetime of Rs. 10 crore can mean a lot for this film. MITRON: It marks the comeback of Jackky Bhagnani after almost 3 ½ years. His last film, Welcome To Karachi, had released in May 2015. It is directed by Filmistaan director Nitin Kakkar and marks the debut of Kritika Kamra. The trailer indicates that it’s a comic caper but it looks very poor. Just like the other Jackky Bhagnani films, this one too is expected to be a debacle at the box office.